Arcadia Publishing, which specializes in books of local history and local interest, is buying "the significant assets" of Pelican Publishing, which specializes in books about New Orleans and Louisiana. The transaction will close in May. Founded in 1926, Pelican has a catalogue of more than 2,000 titles, including such backlist bestsellers as Listen, I Say Like This by Chef Leah Chase and the children's holiday classic Cajun Night Before Christmas, illustrated by James Rice, which has spawned musicals, plays and more. "Pelican has been publishing in New Orleans for almost 100 years," David Steinberger, Arcadia president and CEO, said. "It is a publisher that fits well with Arcadia's mission, which is to connect people with their past, with their communities and with one another." Pelican president and publisher Kathleen Calhoun Nettleton, whose family has owned the publishing house since 1970 and who will continue at Pelican after the sale, said, "We could not be more pleased to have found the right long-term home for Pelican." Walter Isaacson, editor-at-large and special advisor at Arcadia, added: "Books about local history and culture are crucial to enhancing the fabric of American life. As a child growing up in New Orleans, I loved many of Pelican's titles, so it is especially meaningful to have them as part of the Arcadia family." Effective July 1, Northern Illinois University Press will become an imprint of Cornell University Press. NIUP will continue to publish around 20 titles per year and retain its own acquisitions editor and a faculty press board. CUP, meanwhile, will handle editing, production, design, marketing, distribution and sales. Northern Illinois University Press had been looking for a publishing partner since 2016, to help defray the costs of running a publishing program. NIUP was founded in 1965 and publishes titles in a variety of subject areas, including its Slavic, Orthodox Christian and Southeast Asian series. NIUP will be Cornell University Press's fifth imprint, after Comstock Publishing, Industrial and Labor Relations Press, the Southeast Asian Studies Publications and Three Hills. "We are thrilled to be working with Cornell University and believe that Cornell University Press is the ideal partner for the NIU Press and our authors," said Gerald C. Blazey, v-p for research and innovation partnerships at NIU. "We are committed to seeing NIU Press thrive under its new relationship." Dean Smith, director of Cornell University Press, said: "Our colleagues at NIUP have established an outstanding reputation for quality in several disciplines. This model will support their mission." Originally founded in 1869, Cornell University Press was the first university press established in the United States. 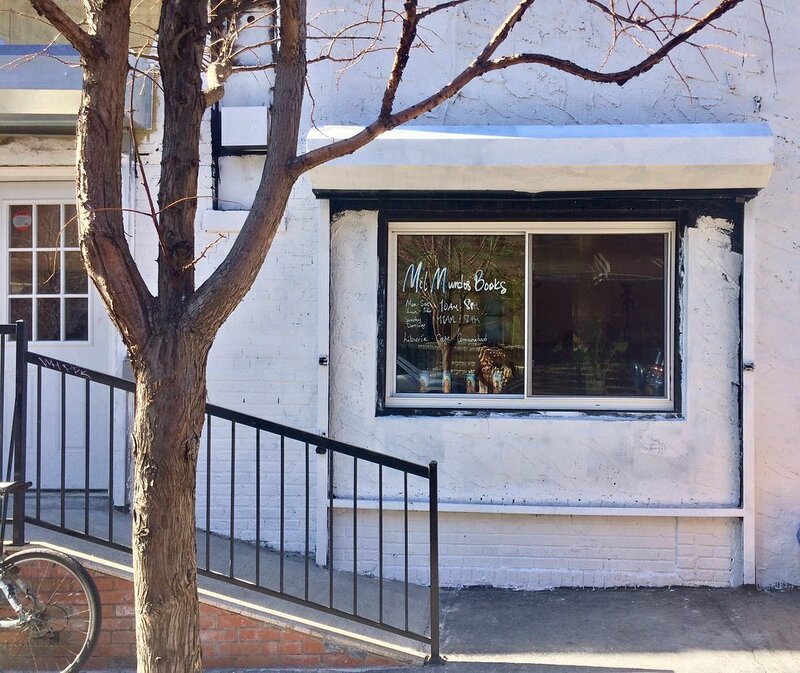 Prior to opening Mil Mundos Books, a new Spanish- and English-language bookstore in the Bushwick neighborhood of Brooklyn, N.Y., last month, owner Maria Herron had spent roughly three years as a bookseller and buyer at Bluestockings Bookstore on the Lower East Side in Manhattan, and her first job at the age of 14 was as a library page. She recalled that, in a way, she's wanted to open a bookstore of her own for years and years. But that desire became something far more real, and pressing, late last year. In the fall of 2018, Herron explained, "with gentrification spilling hard into eastern Bushwick, large tech companies being handed our home city by our elected officials" and spaces for celebrating culture rapidly disappearing, "it became more of a 'we need to do this, to keep our city and culture,' than just a dream." Herron officially began looking for retail space in late December, and on March 15, Mil Mundos was open for business. 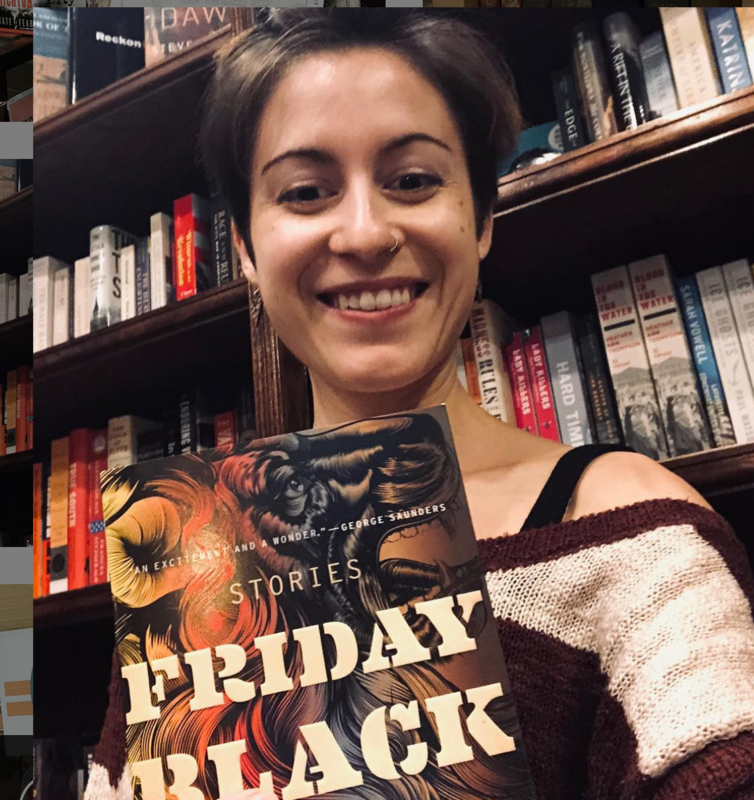 The roughly 500-square-foot store has an inventory evenly divided between Spanish- and English-language titles, with a focus on celebrating black and Latinx culture. And while Herron and her team, which consists of three other booksellers, sell some used books, the majority of the inventory is made up of new titles. She reported that when it comes to sourcing her store's Spanish-language titles, the translations typically come from imprints distributed by larger houses. She acquires others from various small presses in both the United States and abroad, and explained that she formed many of these relationships when she was a buyer at Bluestockings. As for nonbook items, Herron said Mil Mundos carries some arts and crafts items, educational toys for children and a selection of candles. She and her team are currently waiting on stock for a tarot deck about which they are very excited, and are continually looking for new local vendors. Mil Mundos also has a small coffee bar. The store sells coffee, tea and guava pastries, which Herron and company purchase from a local Colombian bakery called Son de Cali. Added Herron: "And at times when it's not too busy, we also brew up Cuban cafecitos as well." Herron and her team have ideas for a variety of events. During the day, they hope to use their space for things like tutoring and homework help, while at night, they plan to host poetry readings, author signings and book launches. 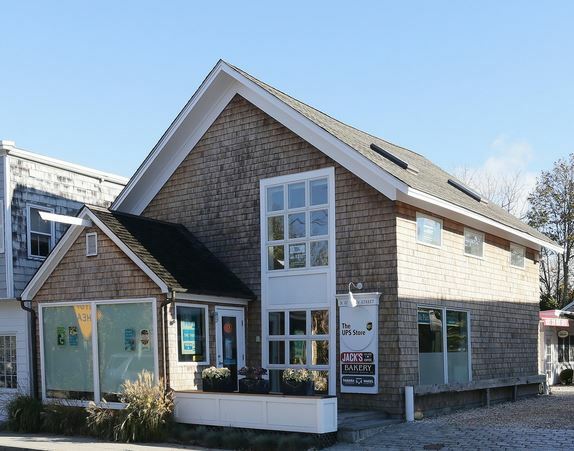 When the impending closure of Harbor Books in Sag Harbor, N.Y., was announced last year, owner Taylor Rose Berry said she was seeking "a creative solution" to keep the business going. The Independent reported that Berry is now "reimagining 'a petite world of magic' where books, tea, and herbs coexist, and has a Kickstarter campaign up and running to realize her dream." More than half of the $25,000 goal has been met through the "Next Chapter for Harbor Books" fundraising page. In a new location at 51 Division Street, Berry & Co. "will feature a curated selection of books, botanicals and tea, combining all of the successful elements of Harbor Books." "I am truly beyond excited to welcome everyone into the new space," said Berry. "I was hesitant to take a space off Main Street, but when I saw the cathedral ceilings and the incredible light and the deck, I knew we could make the space a destination and our new home. The next chapter for us is going to be magical and I've always said that the store felt like it belonged to the community.... We plan on opening in May before the season kicks off, and we hope to see friends, old and new." Melissa Posten, children's buyer and event coordinator for the Novel Neighbor in Webster Groves, Mo., and Clarissa Hadge, bookstore manager and children's buyer at Trident Booksellers and Café in Boston, Mass., are attending the 56th annual Bologna Children's Book Fair taking place in Bologna, Italy, April 1-4. Both booksellers are able to attend because of fellowships from Bookselling Without Borders, a collection of independent publishers that gives American booksellers the opportunity to attend international book fairs free of cost. Founder Michael Reynolds's purpose for this program is to encourage booksellers in the United States to "become a part of an international community of bookselling." Reynolds would like the "book industry to be less compartmentalized" and "for more booksellers to enjoy fruitful relationships with publishers, agents, authors, editors and translators from abroad." His hope is that "booksellers are as impressed as I am by the incredible variety and breathtaking sophistication of publishing realities around the world, and that they return more inclined to enrich their own stores (figuratively and literally) by selling more diverse, international books." This hope is certainly coming to fruition in the cases of Posten and Hadge. "It's a very overwhelming fair," Posten told Shelf Awareness. "It is incredibly cool to see just how big the worldwide publishing market for children is. I feel like we are very U.S.-centric... I think it's easy to think that we are 'it' because so many of our books are taken into other countries. But it's humbling to see just how much is out there that we never see." It's frustrating, too, she said: "I could tell that there were stories that... people would find interesting in our country but I have no idea how we would ever get access to them. Especially the countries where they speak Spanish--there's a market for books in Spanish... and there's a market for translated stories. There's just so many things we don't have." She finished this thought by saying, "This show is, what, five times as big as BEA? Every single thing is a kids' book. And we can't have almost any of them!" The booksellers also spent time meeting with publishers, learning more about bookselling internationally. Hadge said the two had learned that, "due to The Company That Shall Not be Named," independent bookstores and publishers "in Europe have found that they need to... get [books] to the customers much more quickly than before." Hadge was also troubled by how many non-U.S. publishers expressed concerns about distribution that kept them from trying to make their books available in the U.S. market. "I think the more opportunities we have for American booksellers... to come over here and say, 'we have a need for [these stories]' "--to have people on the front lines express a desire and interest in international titles and translated works--"will hopefully produce some results." 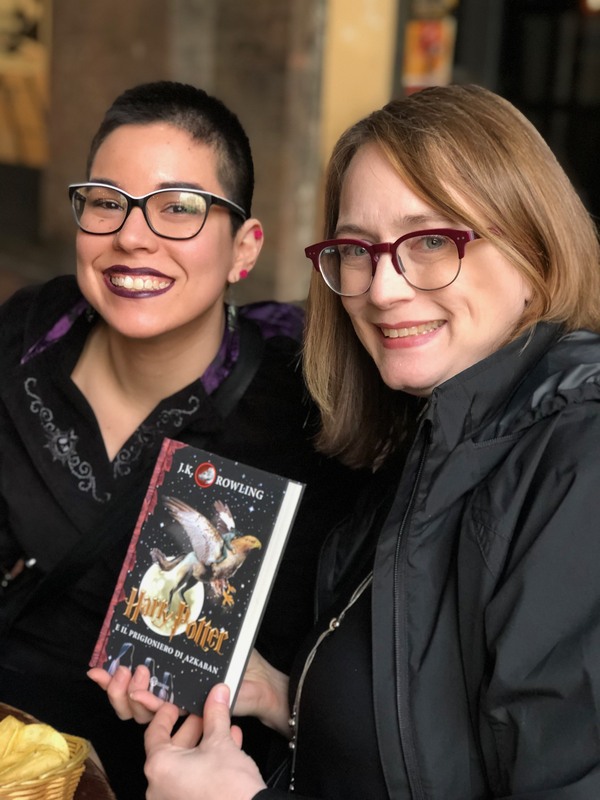 Anna Thorn, the BWB coordinator traveling with the booksellers, said speaking with publishers was "really validating for the whole purpose of the program... Booksellers are the missing part in the entire conversation. We hear exactly what people are asking for and not getting because they don't have access." Matt Wixon, owner and founder of Bookstore Movers and co-owner of Capitol Hill Books in Washington, D.C., died March 22. He was 41 years and had been diagnosed with colon cancer two years ago. DCist reported that in addition to his wife and son, Wixon "also leaves behind a community of friends, fans, and fellow readers at the D.C. institution that has been the nexus of his social and work lives since he moved to the city in the early 2000s: Capitol Hill Books.... The bookstore is a staple of the neighborhood, and Wixon had fiercely loved and championed it since he first started working there in 2004." "Matt was... he's maybe the most amazing person I've ever known," Kyle Burk, co-owner of the bookstore along with Wixon, Aaron Beckwith and Shantanu Malkar. "Extraordinarily charming, generous, and funny. He wasn't a poet exactly, but his heart was.... He was amazing, just great at making people feel like they mattered. I just often had the thought that he was a better person than me. He was so much better at being nice to people." Wixon, Beckwith and Burk met about 15 years ago when they were canvassing for environmental causes in the city. DCist wrote that "Beckwith took a job at Capitol Hill Books, a tiny bookstore in a rowhouse owned by a curmudgeonly former Navy admiral named Jim Toole. Wixon took a job there next, as a shelver, and Burk after that. Malkar would hang out there, too." Over the years "the men made a plan to save up enough money to eventually buy the bookstore from Toole, when he was ready to retire." Meanwhile, Wixon started answering Craigslist ads requesting moving help and in 2005, Bookstore Movers, "named in homage to the store Wixon was trying to save up to purchase, got its unofficial start" and was officially incorporated in 2009, DCist noted. The company now employs about 90 people. In 2018, Wixon and his three friends purchased Capitol Hill Books. Last Friday, Capitol Hill Books observed on Facebook that Wixon "was kind and supremely generous. He was the funniest person we knew. He was our best friend." And yesterday Bookstore Movers posted: "Anyone who knew him now has a Matt-shaped hole in their heart. BUT we are determined to run his beloved company in ways that continually reflect his compassionate spirit and noble values." Image of the Day: Whoooo's at Whitelam? 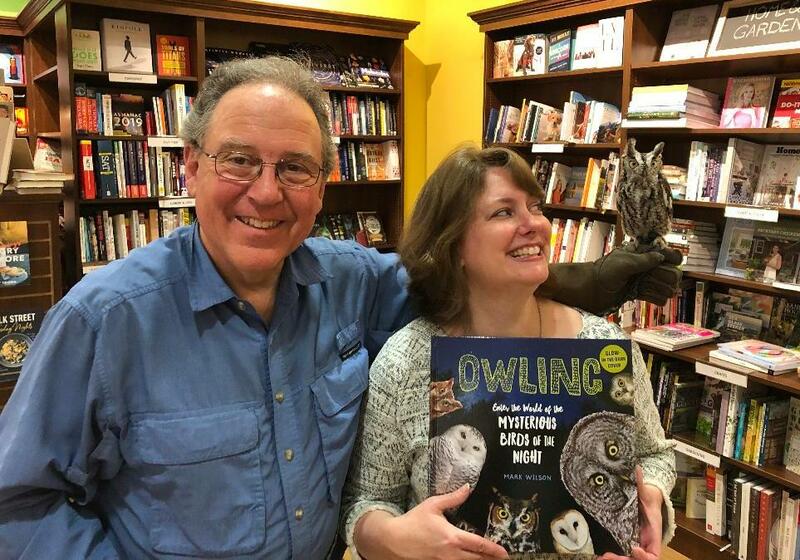 Whitelam Books, Reading, Mass., hosted a standing-room-only crowd for wildlife photojournalist and author Mark Wilson; he brought along his new children's book, Owling: Enter the World of the Mysterious Birds of the Night (Workman), and three live owls. Pictured: Wilson, Whitelam owner Liz Whitelam and feathered friend. New Zealand Post is partnering with a pair of Dunedin businesses to continue delivering postal services and bill payments in the city. Otago Daily Times reported that as "a cost-cutting measure, the organization is closing its stores in north and south Dunedin and Mosgiel, and creating offices within existing businesses in those areas." John MacDonell will take over the South Dunedin post shop premises and turn it into a bookstore that will also contain a space for NZ Post to continue its operations. In North Dunedin, NZ Post will vacate its premises April 10 and move in with the University Book Shop, effective April 11. NZ Post retail head Mark Yagmich said this model of working with local businesses "is more financially sustainable for NZ Post, in an ever-changing mix of postal services usage--the decline of letter mail, versus the significant increase in parcel services." University Book Shop general manager Phillippa Duffy said, "This is a unique community, and we understand our customers' needs. We're excited to be offering the convenience of postal services and bill payments alongside our books, gifts and stationery." Brian McSharry is being promoted to v-p of sales operations. Andie Anderson is being promoted to senior client operations and account manager. Jaime Bode is being promoted to national accounts manager. Vanessa Torres is being promoted to assistant client account manager. Eunice Pak is being promoted to national accounts sales coordinator. Kristen Bonanno is being promoted to national accounts sales coordinator. Emily Day is being promoted to library marketing coordinator, specializing in YA. Jake Swirsky is being promoted to sales coordinator. 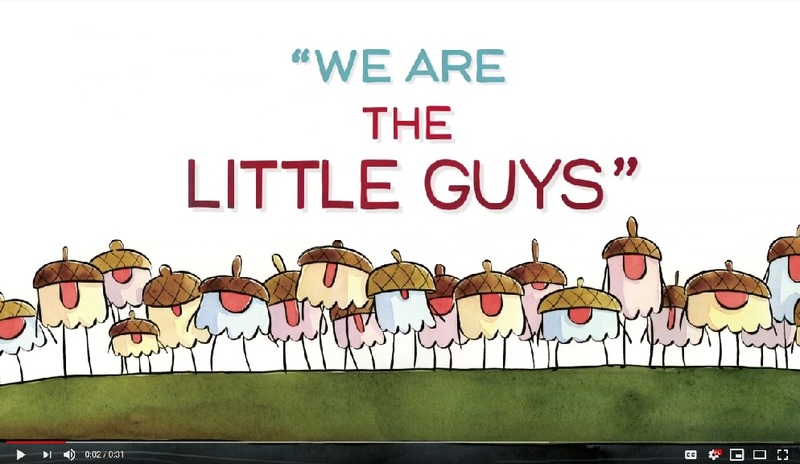 The Little Guys by Vera Brosgol (Roaring Brook Press). HBO's Real Time with Bill Maher: Pete Buttigieg, author of Shortest Way Home: One Mayor's Challenge and a Model for America's Future (Liveright, $27.95, 9781631494369). Late Show with Stephen Colbert: Henry Louis Gates Jr., author of Stony the Road: Reconstruction, White Supremacy, and the Rise of Jim Crow (Penguin Press, $30, 9780525559535). 10 a.m. Roger McNamee, author of Zucked: Waking Up to the Facebook Catastrophe (Penguin Press, $28, 9780525561354). 11 a.m. James and Deborah Fallows, authors of Our Towns: A 100,000-Mile Journey into the Heart of America (Pantheon, $28.95, 9781101871843). 12 p.m. DeRay Mckesson, author of On the Other Side of Freedom: The Case for Hope (Viking, $25, 9780525560326). 1 p.m. Michael Isikoff, co-author of Russian Roulette: The Inside Story of Putin's War on America and the Election of Donald Trump (Twelve, $30, 9781538728758), and Kathleen Hall Jamieson, author of Cyberwar: How Russian Hackers and Trolls Helped Elect a President: What We Don't, Can't, and Do Know (Oxford University Press, $24.95, 9780190915810). 2 p.m. Ken Starr, author of Contempt: A Memoir of the Clinton Investigation (Sentinel, $28, 9780525536130). 3 p.m. Greg Grandin, author of The End of the Myth: From the Frontier to the Border Wall in the Mind of America (Metropolitan Books, $30, 9781250179821), and Reihan Salam, author of Melting Pot or Civil War? : A Son of Immigrants Makes the Case Against Open Borders (Sentinel, $27, 9780735216273). 4 p.m. Evan Thomas, author of First: Sandra Day O'Connor (Random House, $32, 9780399589287). 7 p.m. Michael Mandelbaum, author of The Rise and Fall of Peace on Earth (Oxford University Press, $27.95, 9780190935931). 11 p.m. Katherine Marino, author of Feminism for the Americas: The Making of an International Human Rights Movement (University of North Carolina Press, $34.95, 9781469649696). 6:55 p.m. Clive Thompson, author of Coders: The Making of a New Tribe and the Remaking of the World (Penguin Press, $28, 9780735220560). 8 p.m. Matt Richtel, author of An Elegant Defense: The Extraordinary New Science of the Immune System: A Tale in Four Lives (Morrow, $28.99, 9780062698537). 10 p.m. Sara Georgini, author of Household Gods: The Religious Lives of the Adams Family (Oxford University Press, $34.95, 9780190882587). Flemish author Bart Moeyaert was named laureate of the Astrid Lindgren Memorial Award, which is given annually to authors, illustrators, oral storytellers and reading promoters "to promote interest in children's and young adult literature." The winner receives five million Swedish kronor (about $539,335). The jury said Moeyaert's "condensed and musical language vibrates with suppressed emotions and unspoken desires. He portrays relationships at crisis point with a cinematic immediacy, even as his complex narratives suggest new ways forward. Bart Moeyaert's luminous work underscores the fact that books for children and young people have a self-evident place in world literature." Upon learning he was this year's ALMA laureate, Moeyaert said, "When I was nine, I read Astrid Lindgren's books and the world of Astrid Lindgren was like my own family and the real world was like hers. And later I saw that her world was about inclusion. And that was comforting because I was a loner in my big family since I was the youngest. And this influenced my work. I want to broaden the borders of children's literature." Moeyaert made his debut at age 19 with the novel Duet met valse noten (1983). His work includes more than 50 titles, ranging from picture books and YA novels to poetry. His books have been translated in more than 20 countries. He also writes television screenplays and stage plays, has translated novels, and teaches creative writing. His latest novel, Tegenwoordig heet iedereen Sorry (Everybody's Sorry Nowadays), was published in October 2018. Finalists for the 2019 Hugo Awards; John W. Campbell Award for Best New Writer; the World Science Fiction Society Award for Best Young Adult Book; and the 1944 Retrospective Hugo Awards can be seen here. Winners will be announced and celebrated in August during Dublin 2019, An Irish Worldcon. Working: Researching, Interviewing, Writing by Robert A. Caro (Knopf, $25, 9780525656340) explores the writing process of the Pulitzer Prize-winning biographer. Life Will Be the Death of Me by Chelsea Handler (Spiegel & Grau, $27, 9780525511779) is the TV host's memoir. Someone Knows by Lisa Scottoline (Putnam, $27, 9780525539643) is a thriller about the consequences of a deadly teenage prank. Lost Roses: A Novel by Martha Hall Kelly (Ballantine, $28, 9781524796372) is historical fiction set in Russia and New York during World War I. The Storm on Our Shores: One Island, Two Soldiers, and the Forgotten Battle of World War II by Mark Obmascik (Atria, $28, 9781451678376) chronicles the Battle of Attu in the Aleutian Islands. The Book of Dreams: A Novel by Nina George (Crown, $27, 9780525572534) unites several people around coma patient. The Red Scrolls of Magic by Cassandra Clare and Wesley Chu (McElderry/Simon, $24.99, 9781481495080) is the first in a new series featuring the Mortal Instruments characters Magnus Bane and Alec Lightwood. How to Make Friends with the Dark by Kathleen Glasgow (Delacorte, $18.99, 9781101934753) depicts one teen girl's experience dealing with the loss of her mother. The Peacock Emporium: A Novel by Jojo Moyes (Penguin Books, $16, 9780735222335). France in the World: A New Global History edited by Patrick Boucheron and Stephane Gerson (Other Press, $38.99, 9781590519417). After, based on the novel by Anna Todd, opens April 12. Selma Blair stars as a woman who falls for a man with a dark secret. Lot: Stories by Bryan Washington (Riverhead, $25, 9780525533672). "A brilliant, powerful portrait of a Houston rarely--if ever--seen but aching to be painted. With a command that jumps off the page, Bryan Washington has masterfully filled that void. His characters will grab you by the throat and heart, make you laugh, and make you cry as they navigate the vagaries of living life, loving, and feeling the heartbeat of 'home.' " --Pam Stirling, East Bay Booksellers, Oakland, Calif. The New Me: A Novel by Halle Butler (Penguin Books, $16, 9780143133605). "Halle Butler so perfectly depicts a young woman who has no direction in life in The New Me. She's just going to work in order to get a paycheck for rent and groceries, just so she can live to go to work again--the vicious cycle many in our society find themselves in today. The New Me is juicy and kind of like watching the perfect train wreck. You know you should look away, but instead you can't put the book down. Highly recommended for fellow lovers of contemporary fiction." --Kristen Beverly, Half Price Books, Dallas, Tex. The Unbudgeable Curmudgeon by Matthew Burgess, illustrated by Fiona Woodcock (Knopf, $17.99, 9780399556623). "In this adorably illustrated book, we learn we can all be a grouchy curmudgeon at times. There is nothing more frustrating than trying to cheer up a friend or sibling who refuses to look on the lighter side of life. At some point, you may even find that cheering them up is making you grumpy. So be careful if you try to budge a curmudgeon, because you just might find yourself turning into one." --Kidron Mariotti, Octavia Books, New Orleans, La. Arlo Finch in the Lake of the Moon by John August (Roaring Brook, $16.99, 9781626728165). "The mysteries of the Long Woods deepen in this surprising sequel as Arlo and friends head off to Camp Redfeather for the summer. It's a camping experience just like you remember--if your summer camp came with doppelgängers, time travel, and a lake monster! Author John August's masterstroke is making us love Arlo Finch in the Lake of the Moon even more than the first book in the series. Anyone who read and enjoyed Arlo Finch in the Valley of Fire is going to devour book two." --Gibran Graham, The Briar Patch, Bangor, Me. Izzy + Tristan by Shannon Dunlap (Poppy, $17.99, 9780316415385). "Putting her own spin on the age-old story of star-crossed love, Shannon Dunlap's incredible first novel is a solid reminder as to why I continue to read and sell books on a daily basis. I challenge anyone out there to read the prologue of Izzy + Tristan and not fall head-over-heels for this lovely debut." --Javier Ramirez, The Book Table, Oak Park, Ill. 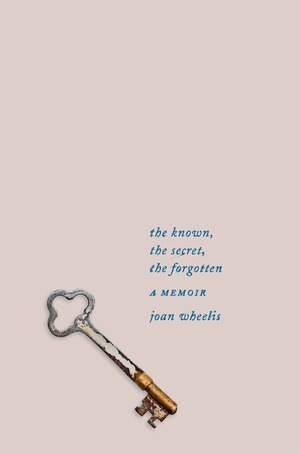 The penultimate chapter of Joan Wheelis's memoir, The Known, the Secret, the Forgotten,is a short vignette called "The Pin." Going through her mother's things after her death, Wheelis finds an old note to her mother from her father, who has also died. It reads, "A stone, a ----, a door." There are two small holes in place of the missing word. Wheelis recognizes the line from Thomas Wolfe's Look Homeward, Angel; the missing word is "leaf. "She is struck by a long-ago memory of her mother showing her a leaf-shaped pin, a gift from her father. Wheelis hasn't seen the pin in 50 years. Later, after dreaming about it, she finds it in a box marked "Important." "I bring it to my father's note and slide the clasp through the two little holes," she writes. "It fits perfectly." "The Pin" is emblematic of Wheelis's book, beginning with the rhythmic similarity "a stone, a leaf, a door" bears to the book's title. Like the phrase, the book is brief but lyrically evocative. And, like the note, its middle is also missing--or, at least, not immediately perceptible. Thisis a memoir of Wheelis's unusual, privileged childhood growing up as the only child of distinguished psychoanalysts in midcentury San Francisco. Told from a vantage point 50-plus years in the future, Wheelis's recollections have a dreamlike quality--misty, distant, but shot through with immediate, vivid details and symbolic suggestion. Her narrative favors impressions and themes over chronology, shifting from scene to scene, memory to memory, without concern for sequential plotting. One moment she's six years old and puzzling over the "endlessly intriguing" mystery of her parents' work, which they both conducted from Wheelis's home; the next, she's having an existential conversation with her elderly father as they watch the Blue Angel jets fly over the Presidio. The link--or the pin, if you will--between the two time periods is her parents' legacy, particularly her father's. Wheelis paints him as an exacting, disciplined man of rigorous intellect and scrupulousness who nonetheless imparted her with a certain zeal for living. The paradoxical remoteness and intimacy of their relationship, and her memory of how it evolved over time, is the cornerstone of the book. Fittingly, Wheelis later describes memory as "the rich layering of time and experience. Built like a stone wall"--one that, eventually, like all things, wears down and falls away. --Hannah Calkins, writer and editor in Washington, D.C. Shelf Talker: Poetic and reflective, this spare but evocative memoir is a lovely meditation on time, memory and generational legacies.